Ora et Labora, Chiang Mai Art Musuem. Installation view. Inson’s performance for the opening of Ora et Labora. Image courtesy of Veronica Caciolli. Panoramic view of Dhamma Park. Image courtesy of Veronica Caciolli. Loredana Pazzini-Paracciani is an independent curator, writer and lecturer of Southeast Asian contemporary art. Complemented by continuous dialogue with artists and art professionals, her research and curatorial practice revolve around critical sociopolitical issues in Southeast Asia, advocating a counter-hegemonic and non-Western-centric discourse. Loredana currently curates Diaspora: Exit, Exile, Exodus of Southeast Asia (2018) with MAIIAM Contemporary Art Museum, and edited the accompanying publication, a collection of essays that examine art and society at the periphery. Other recent exhibitions include Heads or Tails? 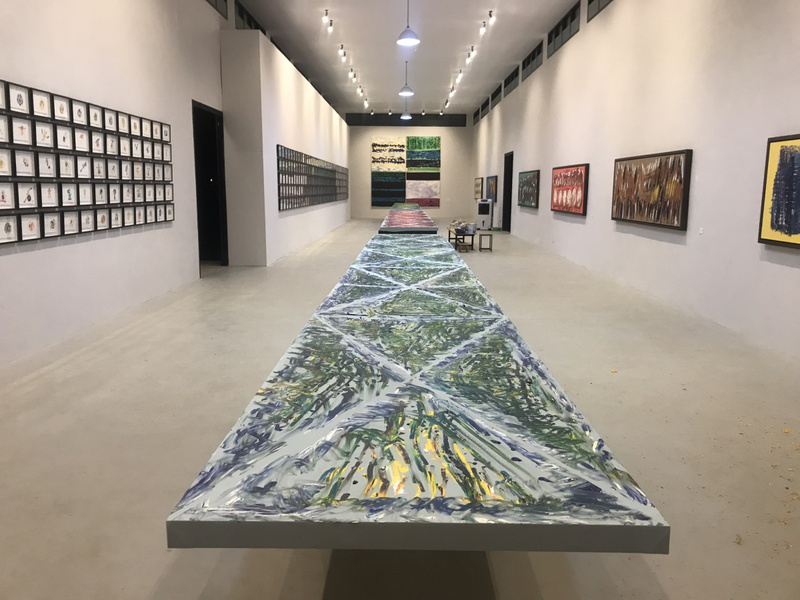 Uncertainties and Tensions in Contemporary Thailand (2017) with Sundaram Tagore Gallery; The Game/Viet Nam by LE Brothers (2016) with Jim Thompson Art Center; and Architectural Landscapes: SEA in the Forefront (2015) with Queens Museum. On the occasion of Inson Wongsam’s major solo exhibition, Ora et Labora, at Chiang Mai Art Museum (23 December 2018–3 February 2019), The artist, and the curator, Veronica Caciolli divulge and enlighten with details on the conception and execution of the show, and Wongsam’s remarkable career. Inson, 84 years old, is native of Lamphun, in northern Thailand, but also a citizen of the world. 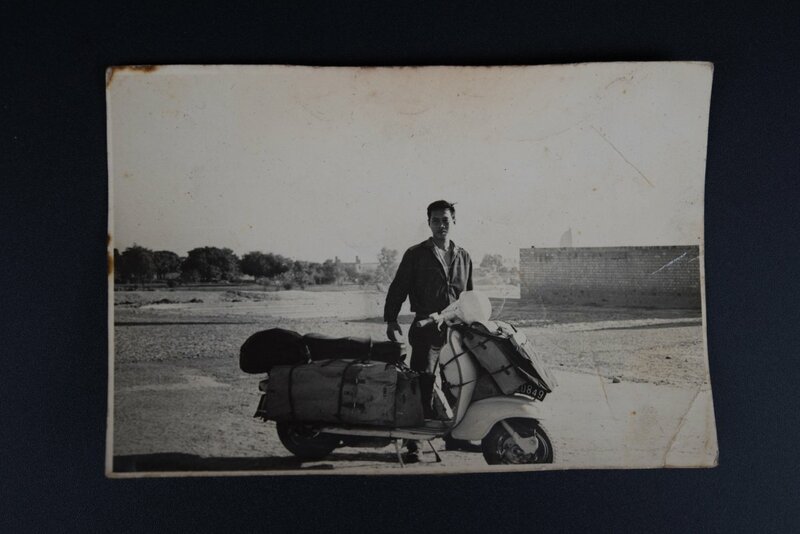 In his travels that took him to Italy via his solo journey across Asia on his Lambretta, he has experienced diverse cultures, beliefs and ideologies. 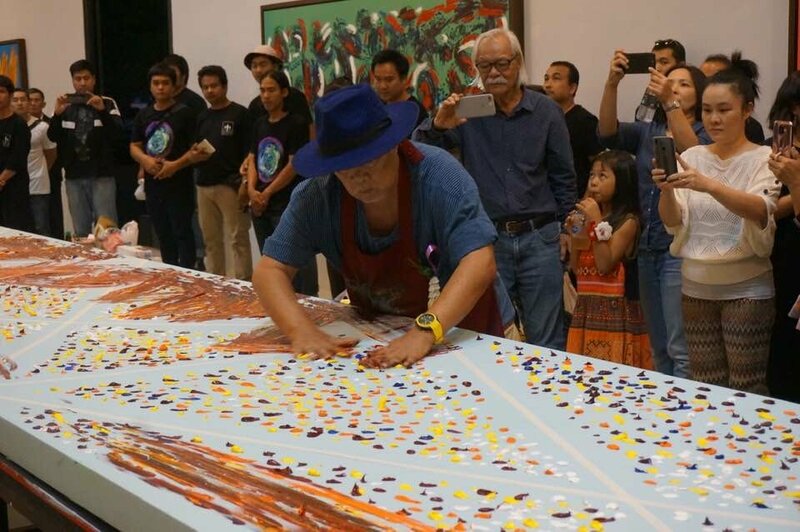 This priceless wealth of experience, coupled with an extraordinary artistic talent, has made him one of the most respected senior artists in Thailand, marking the opening of Ora et Labora a special occasion. Perhaps what is most remarkable, is the size of the survey – on par with a scale of a retrospective, over 400 works were made for specifically for this show. In a way, Ora et Labora foreshadows and advances Inson’s unique presence in Thailand, specifically in the north where Inson is from and where numerous young and senior artists, museums, galleries and non-profit art spaces are emerging, to celebrate Chiang Mai as the cradle of Thai contemporary art away from the hegemonic center of the country’s capital, Bangkok. In dialogue with Veronica and Inson, we discover the essence of Ora et Labora, and the energizing artistic impetus, wisdom, and charisma of the artist, the traveler, the ever-inquisitive Inson Wongsam. Veronica, how did you come to conceptualize this exhibition for the Chiang Mai Art Museum and what were some curatorial challenges you faced? Veronica: Despite the sheer quantity, quality and relationship that the works in Ora et Labora entertain with notion of time (with ours and backforward to the early twentieth century researches), would have been strong enough elements on which to center the exhibition, When I started to closely analyse the works, what emerged were the many artistic and experiential bonds that have been recurring throughout the 60 years of Inson’s practice and research. His 84 years are marked by a dense biography, which starts with his legendary journey on a Lambretta from Bangkok to Italy in 1962 following the footsteps of Corrado Feroci (1892–1962), considered the father of modern art in Thailand and who founded Silpakorn University. Inson’s pilgrimage took him from Europe to the United States, returning 12 years later, to his native Lamphun. This was a long period that saw growth in his practice and work, particularly regarding psychoanalytic and anthropological themes, which ultimately were reflected in the work’s interpretations. His work has never been correctly placed within the history of art, nor has the duality between abstraction and tradition, globalism and locality, the West and the East, cosmopolitanism and asceticism been accurately depicted. There is also his ritual relationship with art. Projecting these various complex facets was my real challenege, being able to connect and insert them in a wider temporal, historical, formal and conceptual scenario. In 2017 you curated another exhibition that featured Inson, in Florence, Italy. Is Ora et Labora a follow-up to that show? Veronica: For the Inson Wongsam tribute exhibition by the Academy of Fine Arts in Florence (where actually Corrado Feroci was formed and from which he obtained the educational model for Thailand), thanks to the valuable collaboration with curator Pier Luigi Tazzi, we selected some of the most significant works made before and during Inson’s journey to Italy. We specifically chose his early traditional figurative woodcuts, for instance, A cat swallowing a fish, a fish swallowing a cat, a work that marks his passage to abstractionism. We also featured about 20 sculptures from the series Under the sea and a selection of symbolic archival materials (photographs, invitations, correspondences, reviews from newspaper). 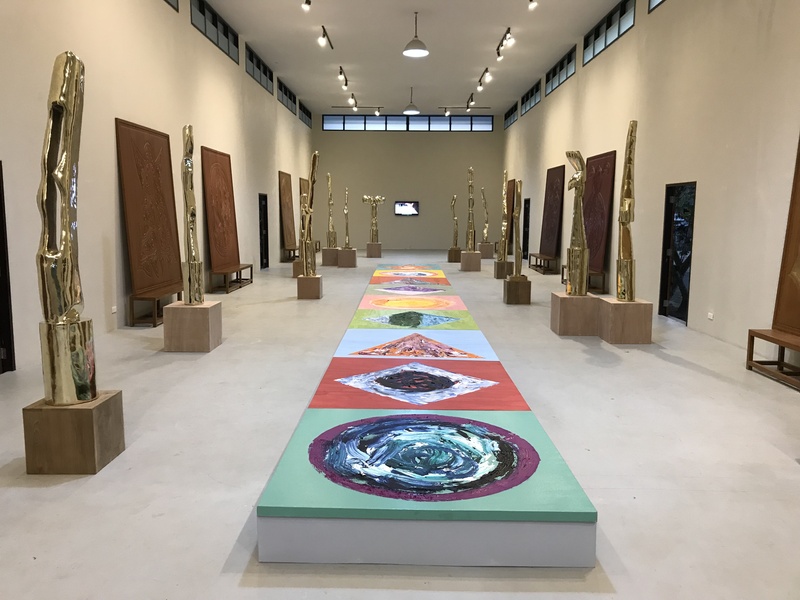 In contrast, for Ora et Labora, every work was produced over the last two years just for the show, including wood and brass sculptures, drawings, abstract paintings and two completely new series in the frame of his path, painted by the artist with his hands and feet, works made in semi-trance following a prayer. Inson, how many works are there in Ora et Labora and how did you produce them? Inson: There are about 365 color drawings and sketches. Also there are artworks from my hands and feet series, as well as focus paintings. Why show only new works, Veronica? Is this a curatorial choice or an approach the artist takes for each exhibition? Veronica: Neither—actually it is Inson’s decision for this particular show. 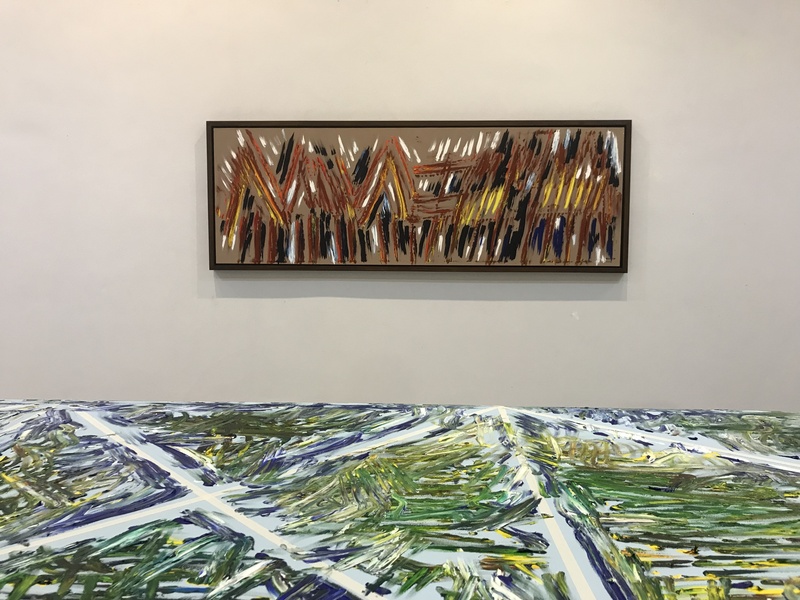 Having the opportunity to exhibit in his land, he was driven by the desire to show new works, in addition to the powerful impulse, to produce them. For him, art continues to be an obsession and simultaneously, an effective pacifier. What is art for you, Inson? Inson: Art is therapy. Art calms the mind. Applying art to our daily lives can help us to be happier. In your curatorial essay, Veronica, you discuss Hal Foster’s notion of connecting the past to the present, of “pushing forward and backward.” Can you elaborate on this in relation to Inson’s art? Veronica: In The Return of the Real, Hal Foster argues that “an event is only recorded thanks to another that re-encodes it; we come to be what we are only through deferred actions […] as a continuous process of pushing forward and backward, a complex system of anticipated futures and reconstructed pasts.”1 The recovery (of a process, of an ideology and of a style) is therefore a ‘deferred action’ that does not repeat the events tout court, but makes sense of them and constitutes them. Inson’s recurrence to the powers of abstraction can sometimes be interpreted as anachronistic, but this only reveals his position on the temporal axis of ‘[pushing] forward and backward,’ in sync with our times. On this last point, Veronica, on Inson’s exploration of the notion of time, for the opening of Ora et Labora, he presented quite an extraordinary performance. Does Inson usually ‘perform’ for his exhibitions? Inson, you are 84 now. What do you see in your future? Inson: I am 84 years old, I was born in 1934. I have lived for so long, I could live at the most for another 10 years. No one knows how his or her future will be. Only the strong survives, and the weak perish. Mentally or physically, only the artist will remain. In your curatorial essay, Veronica, you say that Inson uses abstract art as the best way to express himself. Can you elaborate on this? Veronica: The advent of abstractionism in Inson’s practice represents a turning point. He discovered it while passing through Greece on the way to Italy in 1962, and it has become for him the artistic language that better than any other can “reflect the state of mind, and to mediate a universal language, as unconscious and symbolic. For him the artist is not a creator but a discoverer.”3 Art becomes a form of meditation (and, possibly, a Buddhist emanation), thus the artist should turn to the community and abandon every form of individualism. Here also emerges that symptomatic approach of a vague determination of the boundaries between art and religion. Inson, what is your inspiration to create art? Inson: My inspiration is Dhamma, and Art. What is Dhamma? What is Art? Metta (Compassion), Karuna (Kindness), Mutita (Sympathy) and Ubekka (Equanimity)—these are the core teachings of the Lord Buddha to help people find their happiness. Veronica do you approach Inson’s art primarily from an Asian or a Western approach, or a mixed of both? Veronica: We could say that Inson’s practice is a hybrid because of his western art education, his asian-traditional-rural origins, which in the course of his life he abandons and then radically reaffirms, his use of international visual languages (abstractionism, unconsciousness, performance) coupled with local arts and his contemplation of Buddhism. I take a Western or international perspective that refers to one part of Inson’s thinking process, but I try to integrate it within his context. Veronica, you have visited Inson’s studio-house-museum, the Dhamma Park Gallery, many times during this and the previous projects. Can you tell me about your experience of this place which seems to invoke magical feelings? Veronica: First of all, it is important to note that the Dhamma Park was founded in 2000 by Inson with his late wife Venetia Walkey, a Buddhist satirist sculptress from UK. She was fundamental to the center; sadly she passed away last year. 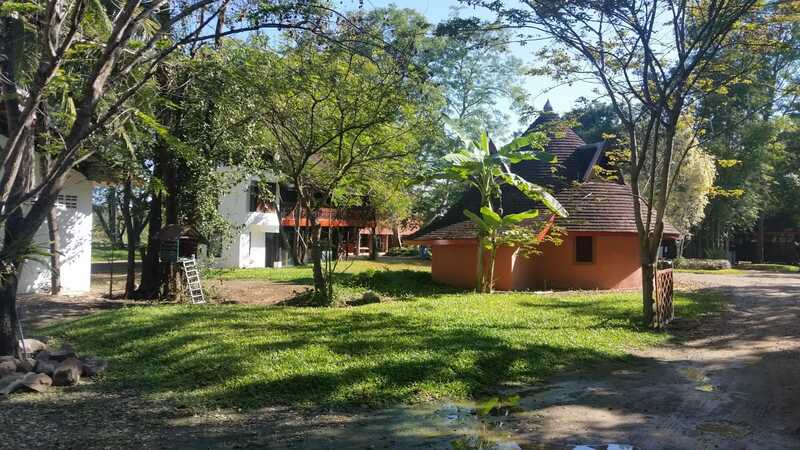 The Park is located in the countryside, in the Lamphun province. There you may find artist studios, Inson and his collaborators’ houses, his sculpture park, as well as various galleries including one entirely dedicated to Venetia. Each dwelling, designed by Inson, follows the local and traditional style—all made in teak wood. We know that Thailand is a country that has always been very open to external influences; this resistance, instead, represented by Inson’s choice of material and design for the park, can be considered pioneering to what is now a more widespread approach to cultural preservation. Tropical plants and flowers permeate the center, as well as art works. I love to be there, that’s what I think of when I imagine the Garden of Eden. Inson, the Dhamma Park Gallery is a public space the people can visit, but it is also your house. How do you spend your time there? Inson: My place of birth and the place I will live for the rest of my life is Ban Sam, Pasang district, Lamphun province. My house is beautiful in my view. It is where I can achieve peace of mind. 1 Hal Foster, The Return of the Real. The Avant-Garde at the End of the Century (Cambridge: MIT Press, 1996). 2 Carl Gustav Jung, Man and His Symbols, eds. Franz M. L. von, Aniela Jaffe, Jolande Jacobi, and Joseph L. Henderson (New York: Ferguson Publishing, 1964). 3 Tuksina Pipitkul, ed., Inson Wongsam: The Autonomous Spirit (Bangkok: Bangkok Art and Cultural Center, 2014).